Well, folks, YAL Washington, DC Weekend 2001 has come and gone. This event had about as much anticipation in this town as the Redskins first win this season. (Ok, for the Greek Community, it was a pretty big deal.) Overall YAL Washington, DC Weekend was a great time with very little to be disappointed with over the course of the three days. It’s hard to say anything critical about this weekend, but as always, there’s room for improvement. The weekend’s festivities kicked off on Friday night with a Greek Night at Ooh La La on M Street. This was the first time a Greek Night has ever been held there, but it was an excellent venue for this event. There was a good-sized crowd, despite the absence of the under-25 Maryland contingent that often dominates most Greek Nights. The few under-25 Virginian non-YALers who were there commented that they had only heard of the Greek Night that day, and some hadn’t even heard of the Dance on Saturday night. The music was okay, although the American mix was a little much at times, and didn’t really stand out as being good or bad. The Greek music, and thus the great majority of the dancing, didn’t really start until later in the evening. While the dance floor could have been bigger, the rest of the club definitely did not have the usual Greek Night feel about it, which was a good thing. Unlike Greek Nights at Pangea or Diva, there wasn’t as much pushing or elbowing and people were able to stand still for more than five seconds without being forced to keep moving by the mass of people behind them. There was actually plenty of standing room on the far side of the bar, with room for people to have a conversation far enough from the music without screaming into each other's ears. Just beyond the far side of the bar was a plush lounge area with glass doors that muffled the music allowing for relaxed sit-down conversations. This was supposed to be the venue of the Speed Dating sessions. What happened to Speed Dating? There was great hope for this to be a fun twist to the normal Greek Night early in the evening. There were two lists going around the room asking for guys and girls to sign up, with the plan of starting the game around 11:30. As predicted in last week’s column, there was more participation by the guys than the girls, but we were shocked at how skewed the early results were appearing. The discrepancy early on in the night had guys signing up at a 4 to 1 ratio, with over 20 guys and about 5 girls having signed up. We must commend the organizers for not letting this initial setback discourage them, because by the end of the evening the ratio was almost even, with about 25 on each side ready to go. The only problem, and the reason that Speed Dating never happened that evening, was that when the ratio got even, sometime well after midnight, the Greek Night was in full swing, and to pull people from a good party at that point would have been anticlimactic. Still, just the fact that you could get 50 Greek-Americans willing to participate in something like this is a good sign that there may be hope for this community being able to not worry so much about perceptions and just have a good time. We really can’t give a first-hand account of the Capitol Tour as we, like many DC natives, due to size-limitations for security reasons, voluntarily opted out to allow for the out-of-towners to get a chance to participate. We heard that there were only about 20 people on the tour as too many DC natives voluntarily gave up their spots. The Barbeque back at St. Sophia’s was a good time. St. Sophia always knows how to throw a good barbeque with plenty of food and drink and a good-sized area to relax with friends and play volleyball. The Dance on Saturday evening was a really great time. The organizers decision to bring the event into the heart of DC, back from such outposts as Frederick, Maryland, led to about three times as many people attending this year’s event. The Philly-based band, Atlantis, which played at last year’s event, was back again this year. Their music selection was the opposite extreme from the Greek Night, with the band going exclusively Greek after 11:30. This was a little disappointing because unlike the Laconian Dance in November, a bunch of Greek-Americans in their 20s and 30s (perhaps pre-partying with 40s) can have fun on a dance floor without their parents, who in their 50s and 60s, would be resurrecting dance moves would from the ‘70s. With regard to the Greek music, it was good to hear at least a few Tsamikos being thrown in with the heavy doses of Kalamatianos, Tsiftetelis and Zeimbekikos. Speaking of Zeimbekiko, four goats goes to the staff of the Grand Hyatt who cleaned up the broken Heineken bottle in the back right corner of the dance floor immediately before it became a hazard. Remember fellas, china has a much lower shrapnel risk than green glass, which is hard enough to recycle as it, so think before feeling the need to show your appreciation by breaking things. (“Smash Responsibly. A message from The Guys @ DCGreeks.com.”) Speaking of beer bottles, there could have been at least one more bar in operation in the ballroom to cut down on the ridiculously long lines that kept people away from the action. While we’re still on the subject of the Dance, we just have to comment on how amazing everyone looked at both the Dance and the Greek Night on Friday. We’ve put many of the pictures from both nights on the site. While we are by no means professional photographers, just look how good everyone looked, both the girls and the guys. It was like the residents of Mount Olympus decided to go slumming on Capitol Hill for the evening. There were a few after-Dance options for those who weren’t staying in the hotels. 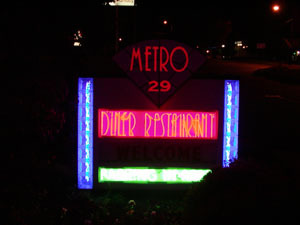 We checked out the Metro 29 diner in Arlington, which had three full tables of Greeks in there until around 3:30 A.M., staying open later to accommodate a good Greek crowd. Although the Metro 29 breaks our “If it’s not on the cone, leave it alone” rule on gyro, you can’t complain about the sheer quantity of food at 3:00 in the morning. Anybody make it to church at St. Sophia’s on Sunday? If you did, sygharitiria, because there was no way The Guys @ DCGreeks.com were waking up in time to make it back into the District. There was brunch after church as well, which we’re sure was excellent. All in all, YAL DC Weekend was a huge success both as a fun event and as a fundraiser for Project Mexico and the local host YALs. Half of the cover charge from Friday night and a portion of the ticket sales went to these charities. The organizers of this event and all the DC area YALs deserve everyone’s thanks for organizing the weekend’s festivities. While the turnout for both main events individually was good, there has to be more of an effort to make sure that the people from Friday night’s Greek Night come to Saturday’s Dance and vice-versa. For some reason many people, especially locally, really didn’t think of both events, along with the Barbecue and the Capitol Tour, as part of an all-inclusive weekend -- for some it was like a series of unrelated events. Missing from the Dance were many young people that you would see at an event like the Laconian Dance in November. If you can get all these young people at the Laconian with people our parents’ age there, there should be no reason for them not to come to something like this where they can let loose without their parents and their parents’ friends present. The greater the connection between the Greek Night and the Dance, the more people will realize that this truly is a YAL Washington, DC Weekend and not just some Greek Night coincidentally followed by a dance.